On the shores on the Congo River in Kinsangani. Photo taken by Judith Rose on Flickr. 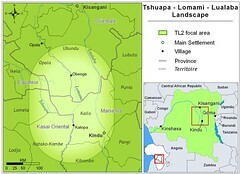 Kisangani is DR Congo’s 5th city with less than a million people according to fr.wikipedia. 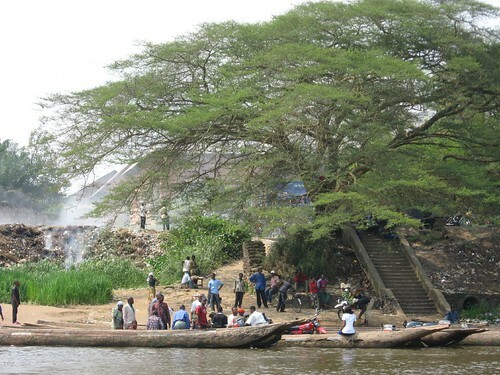 It is situated on the fleuve Congo (river Congo) and is surrounded by forest. It gets very hot and humid here, with incredible storms. I seem to be permanently covered in sweat. You do get used to it but it is also rather uncomfortable. Personally I prefer it to Kinshasa though, which is huge, very busy, noisy and filthy. This city suffered heavily during the civil wars of 1996-2004. A lot of people were killed here and I’m sure the people could tell a few stories about this. Very sad. It is classic Congolese from what I have seen. Everything is run down, falling to pieces but has a look that in colonial time it would have been quite spectacular. What a shame that transition couldn’t have gone smoother. For a white person it is nice here because you can walk the streets without people giving you too much hassle and I even walk home at night and don’t feel bothered, unlike say some parts of London. For me personally it is also nice being here. When I was a little boy I read a book about sailing up the Congo River from Kinshasa to Kisangani and the kind of adventure it was. All the strange people on the boat, the animals on the boat and the huge forest all around. All the comings and goings of these boats. Like for example, other small boats attach themselves to these big boats and over time more and more attach themselves. Finally the captain has had enough and he just drives into the side of the river and basically knocks them all off! Not sure if that still happens — though nothing seems to have changed on this river in the last 20 years. The story then talks a little bit about Kisangani as well. So maybe in one of these weird subconscious ways that is why I have ended up here. Photos: check out Flickr photo results for Kisangani. Google has yet to put high res images of Kisangani. Take a look anyway and realize that it’s in the middle of the jungle. Books: V.S. Naipaul wrote a A Bend in the River (on Amazon, not in Congo!) which is set in early post independance in Kisangani. Very popular book among expats here. Kurtz was also near Kisangani in Conrad’s famous Heart of Darkness which inspired Coppola’s Apocalypse Now. Videos: Here’s a short video on a typical “dancing on the pirogue” on YouTube. Only in Congo. Still on YouTube, someone made a clip of driving near Kisangani. It’s not downtown, but gives you an idea of the surroundings. Readings: Of course, there’s always Wikipedia to tell us more on the city. MONUC, the peacekeeping mission, has a city description in detail in French only. This entry was written by Terese Hart, posted on 2007-05-31 at 3:36 pm, filed under About the project. Bookmark the permalink. Follow any comments here with the RSS feed for this post. Post a comment or leave a trackback: Trackback URL.